UNAIR NEWS – Two students of Universitas Airlangga have made the alma mater proud. 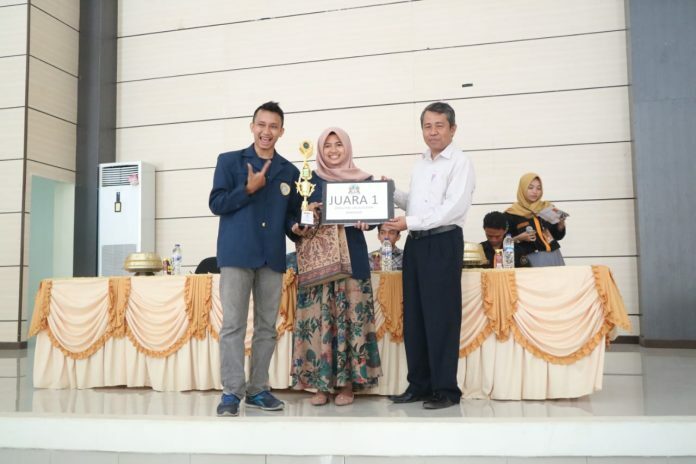 Universitas Airlangga Faculty of Public Health (FKM) student, Shulkhiatus Syafa’ah and Farid from Faculty of Social and Political Sciences (FISIP) won 1st place in Neo Clue 2018 (National Conference of Inclusive Economic 2018). The competition from October 17 to October 22 was held by Faculty of Economics Islamic Business (FEBI), State Islamic University Alauddin Makassar. Both students from the Student Reasoning Club (UKM) promoted Ecofeminism as a new direction for sustainable and Gender-based economic development in their work. “The title of the work we registered and won first place was ‘Sharia Health Insurance through Clam Waste by Involving Women as the Main Promoter’. We prioritize the issue of ecofeminism in this work, “explained Farid. The concept of ecofeminism is a concept proposed by Vandana Shifa. The concept relates the relationship between nature and women. The focus point stated that the damage done to nature was the result of the oppression to women. Farid said that this shared idea was based on the problem of empowering women in the coastal area. “In coastal areas, there are still many women who have not been empowered. Our idea is to empower them through the sharia clam insurance we proposed,” explained Farid. Their ideas put more emphasis on the role of women in managing the environment. The role of women here is for waste management on the coast. The idea they expressed got a good reception from the judges, especially in empowering the women community. It can also be seen from the results of the judges’ assessment that was displayed because of the suitability of the themes and ideas that was different from the others. “Our score as the first winner was 210 points, while the second winner was quite far at 165 points,” said Farid. Farid also admitted that the preparation was not long. The two of them only made preparations after mid-term test. “I am very happy, not only for winning 1st place. We also got inputs from the judges,” said Farid.